That is a lot of writing on one bottle. That’s a trademark of Dr Bronner’s Castile Soap and makes it easy to pick out on the overcrowded shelves, but after a little read of all that writing, I realised that there was something a little unusual about Dr Bronner and his Moral ABC’s All-One-God-Faith soap. I’m not used to my soap giving me philosophical advice, but it does make for interesting ‘I like standing under a warm shower not doing much for 20 minutes’ reading. After all, absolute cleanliness is Godliness (says Dr Bronner). To give a little background, Dr Bronner was an eccentric Jewish man who escaped Nazi Germany for America and then spent his life developing his personal philosophy as well as his family trade of soap making. Dr Bronner’s Castile Soap was born. Originally Castile Soap meant that the soap was made from olive oil in the Castile region of Spain, but has since developed into meaning any kind of soap made from vegetable products instead of animal based fats. This also means you get a simple soap instead of a blend of detergents, which is better for the environment and better for you too. 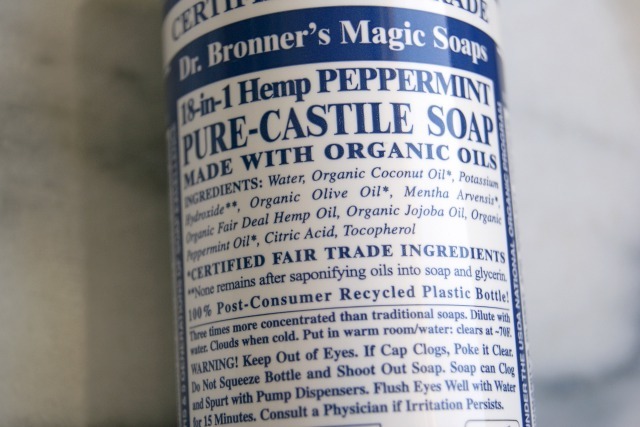 In fact, Dr Bronner’s soap only contains 10 ingredients, which are water, organic coconut oil, organic olive oil, Mentha Arvensis, organic fair trade hemp oil, organic jojoba oil, organic peppermint oil , citric acid and tocopherol. In a rare event in modern beauty products, I actually know what most of those things are. This soap will have you believe from it’s label that it has 18 uses, but I think there’s probably lots more to it. I’ve detailed some of the beauty related ones below, but there are also numerous household uses too. Gotta love an all rounder. 1. Body wash. This is my most common use for Dr Bronner as I keep the bottle in the shower. I have the peppermint scent which is quite refreshing (you certainly feel clean!) but does leave a bit of a tacky feel to the skin. I add a small squirt to a washcloth when I feel like a want an extra good wash, but don’t use it as my every day wash.
2. Cleaning make up brushes. I love this for cleaning make up brushes. It’s effective, cheap, convenient and smells good. 3. Shampoo. I may be hyper sensitive to products that strip my hair but I wouldn’t be keen to use this as my regular shampoo. I imagine it would give a nice deep clean but a lot of conditioner would be needed to restore the balance. 4. Face wash. Again, I think the peppermint in this would be a little severe for my face, but a different scent or less sensitive skin would get a nice face wash from this. 5. Toothpaste. Even though I have the peppermint flavour, I have been assured that if you fill your mouth with it, it still tastes like soap. I’d use it if I was in a pinch, but it’s not my daily choice. 6. Bath oil. This doesn’t lather up as much as it does if you use it on your hands or body and is more like a bath oil, but it’s still a nice, refreshing scent for your bath. 7. Shaving foam. A few drops of this work into a lather well over a small area and make a good substitute for shaving foam. You can also use Dr Bronner for washing dishes, mopping the floor, making an all purpose cleaning spray, washing windows, bathing your pets, keeping bugs at bay… the list goes on. Overall, I like Dr Bronner’s soaps. It wouldn’t make my every day favourites list for anything, but it’s a good back up product to keep around for emergencies. No more running out of shower gel/washing up liquid/toothpaste emergencies for you. As always, I love to hear from you. 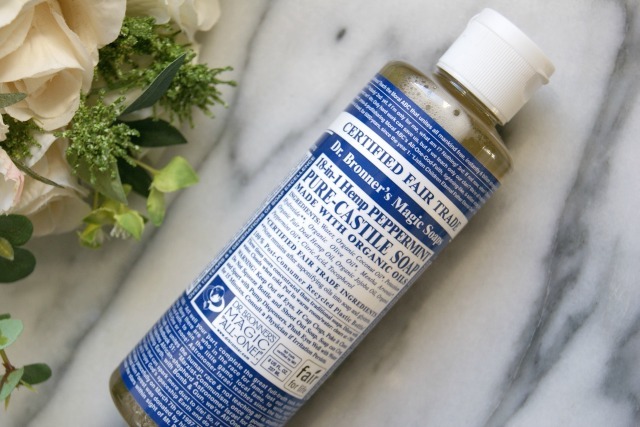 Have you tried Dr Bronner’s products? Or do you have any other multi use products that are good to have as your back up plan?